Are your fears and phobias limiting your life? Do things just seem to make you feel uncomfortable? Do you react irrationally to an imagined or anticipated event? Wouldn't you like all of those nasty fears to finally go away? 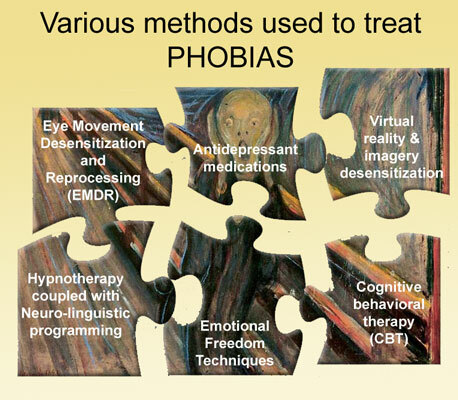 Our Fears and Phobias sessions are designed to help you free your mind (and body) of these learned, limiting problems. It is time to regain your freedom and start enjoying life! Are you fearful of going out into public places? Do you worry about having a panic attack somewhere public? Are you afraid of getting stuck in traffic? This session will eliminate your panic attacks and help you gain control of your life. Do you constantly think about death? Does the word ‘death’ make you feel anxious? This session will help you to overcome fear of death and you will be able to enjoy life again. Are you terrified at the mere thought of ever having to see a dentist? Do you get sick when contemplating going to your next dental visit? Does the thought of having a shot make you feel ill? This CD will help you overcome your fears and you will easily and calmly go to your next dental appointment. Is your fear of dogs is so intense that you panic if you come across one? Do you avoid visiting friends that have dogs? Does just hearing a dog bark make your heart race with fear? This powerful self session will eliminate all of you fears. A fear of flying prevents people from going on vacations or visiting relatives and friends, and it can cripple the professional career. Are you unable to fly to certain destinations because of your fear? Do you feel miserable for days before the flight? This professionally designed flight session will eliminate your fears and will help you to enjoy flying. Fear of heights can be very dangerous, as sufferers can experience a panic attack in a high place and be unable to get themselves down safely. Does your heart start racing and your head start spinning when you are in a high place looking out? This self hypnosis session will show you how to feel safe and secure no matter how high up you are. Are you terrified of all needles? Does the thought of shots get you to the point where you avoid them even when they are absolutely necessary? This session will teach you how to control both your emotions and your body so that getting a shot will not bother you ever again. The fear of spiders can often be triggered by the thought of or sometimes even just a picture of a spider. Do you experience rapid breathing and heartbeat when you see a spider? This powerful self hypnosis session will change the way you think about spiders forever. Are you afraid of darkness? Does your heart start beating rapidly and you find it hard to breathe? Do you panic if the lights go out? Do you sleep with a light on? This hypnosis session will easily and effortlessly allow you to eliminate the fear of dark. Are you constantly afraid of certain things in your life? Do you have extreme reactions to situations in your life and wish that you could live normally? Are phobias limiting your quality of life? During this hypnotherapy session your mind will accept the new fearless way of thinking.